I've been listening to a lot of Christmas music lately and one of my favourite holiday tunes is Christmas Waltz (a really lovely version by Mindy Gledhill!). The song opens with the lyric 'frosted window panes...' which was the inspiration for this winter manicure. I attempted a frosty, snowy backdrop with snowflake accents pressed upon a window. I had a lot of trouble with this manicure and I had to restart my ring finger from scratch three times. Also this marks my first attempt at using striping tape. The end result is crisp and appealing but I didn't like the process very much at all. I'm way too impatient! I started with a base of American Apparel T-Shirt. Then I used the watercolour technique with American Apparel Factory Grey, American Apparel The Valley, and American Apparel L'Esprit. 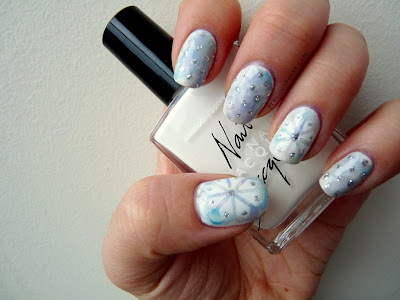 For the snowflakes I used striping tape, a white striping polish and a tutorial by Simple Nail Art Designs. Finally I used a silver glitter polish and a dotting tool for the finishing touches. Your mani is so pretty! !